I believe in fate or kismet or whatever you may want to call it. Recipes or things often present themselves at a time when I need them. Case in point was this recipe. I was cleaning up and saw this magazine, open on this recipe. I meant to clean up and throw it out but I hesitated as the photo of the pork was so eye catching. We were having the in laws over that weekend and that meant feeding mostly vegetarians. I had planned on making a simple Gado Gado but then I realised that my non vegetarian brother in law despises peanuts. My mind immediately went to this pork recipe that I had seen only hours earlier and so it was decided that I would make this too. The only thing that confounded me was tying the string. The local butcher could do this but my husband wanted to give this a go and I have to applaud him, his experience as a sailor meant that he had tying the string down pat. While I peeled the apples for the apple sauce, his hands whizzed over the loin and tied it perfectly before I had the second apple peeled. This is a Donna Hay recipe and like all of her recipes it's styled beautifully and is beautifully simple not requiring a wedding guest list sized amount of ingredients. In truth this could serve 4-6 people depending on how hungry they were but I would suggest making this for 2-3 people because of the delicious leftovers. 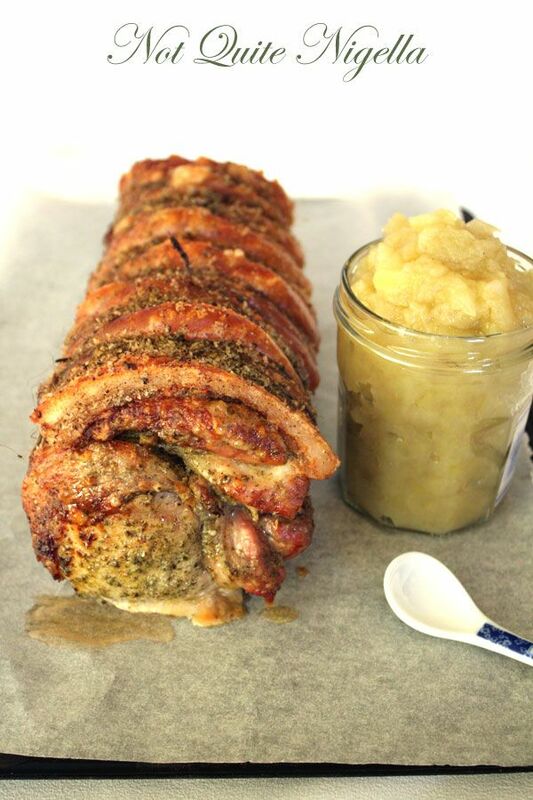 In this case, the pork actually somehow becomes _more _tender the day after and when sliced paper thinly, it is absolutely mouth watering on buttered fresh bread with a generous dollop of the apple sauce. Or you can pop it on top of a bowl of ramen or noodle soup. 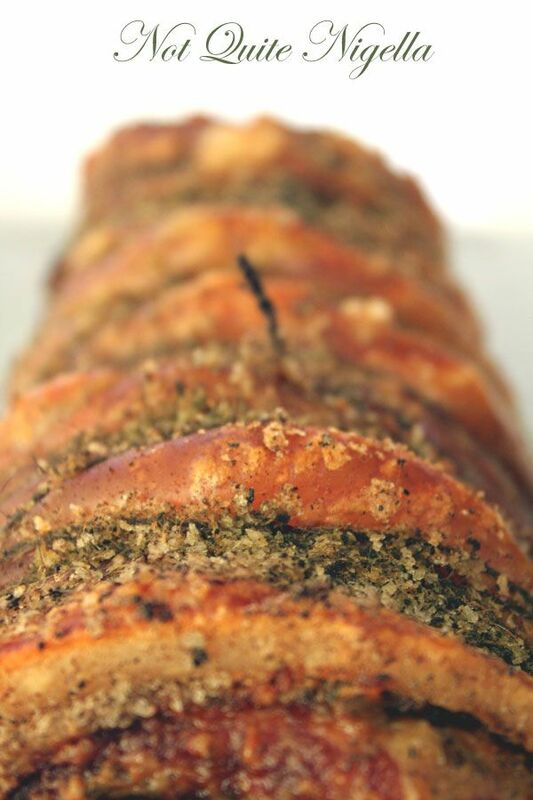 Your tastebuds will indeed be thankful the next day for this foresight. 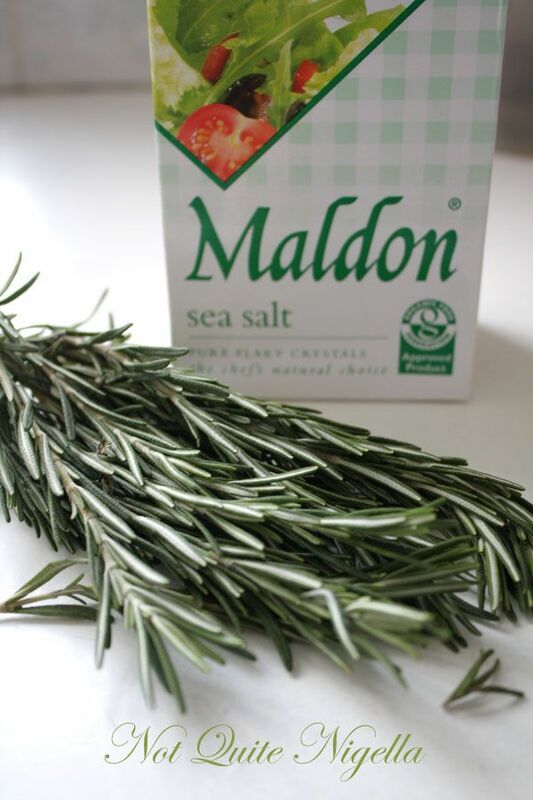 The proudest part of this is of course the crackling, heady and flavoursome with freshly ground rosemary salt. Crackling is one of those things that I know is so damn bad for me but I just cannot tear myself away from it. Crackling is my Crack. Some people can eat a whole tub of ice cream, for me it's 1/3 of a scoop and I'm done. But with crackling I need to put safety guards up and tell those around me to take it away from me should I bliss out crunching on the fatty, crispy goodness. You can tell when I've entered this state as my eyes are closed and I'm not listening to a word you or anyone else is saying. The earth shatteringly crispy crackling sound is ringing in my ears and you see, I'm listening to the pork crackling. Step 1 - If you have time the night before, leave the pork skin uncovered in the fridge (cover the loin though) so that it can dry out as much as possible (to make the crackling extra crispy). Preheat the oven to 220c. 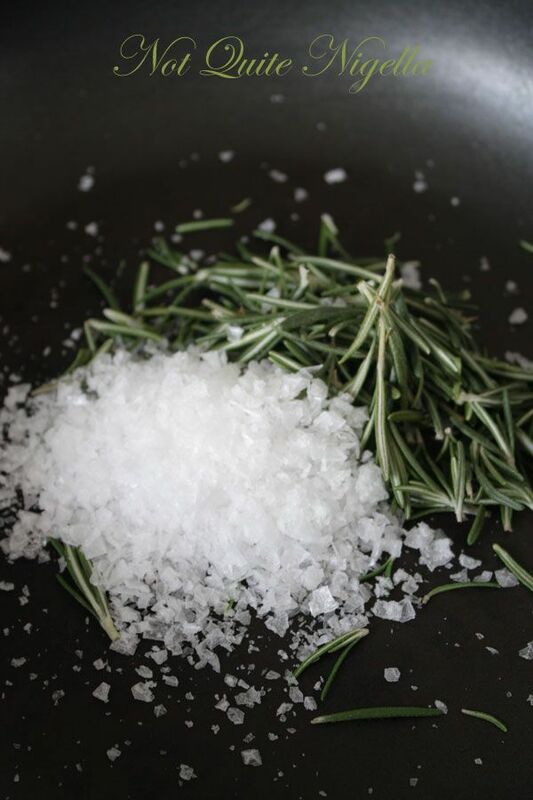 Step 2 - Place the rosemary and sea salt in a small frying pan and cook for 1-2 minutes over a high heat until the fragrance of the rosemary comes out. 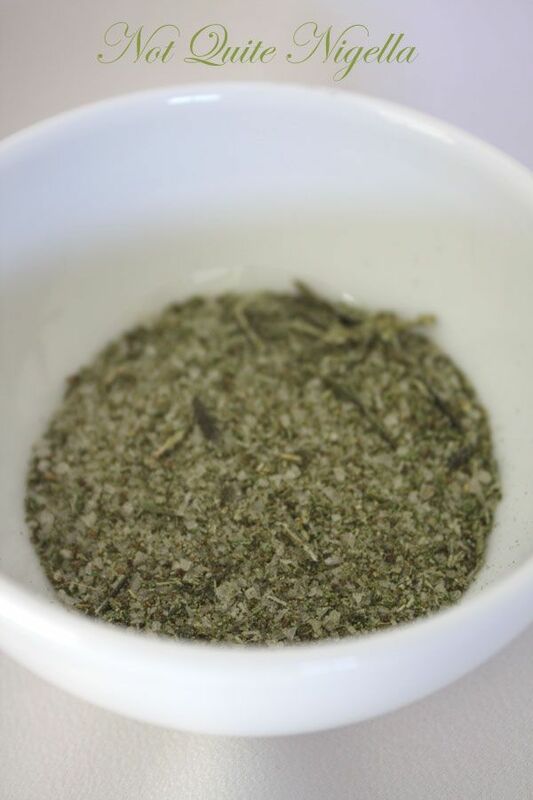 Grind salt and rosemary with a mortar and pestle until it becomes a forest green shaded salt mixture. Step 3 - Dry the pork skin as much as possible with paper towels to make sure every drop of water is removed. Using a very sharp knife, score the rind horizontally across or in whichever pattern pleases you. 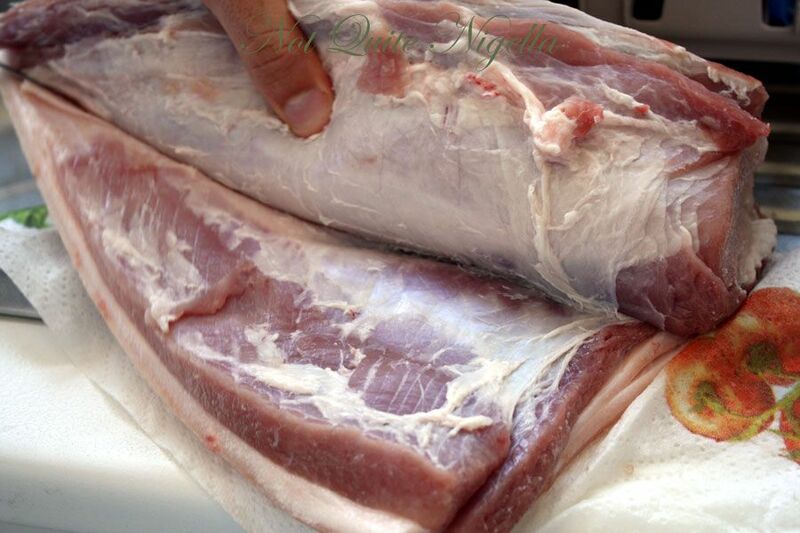 Cut the loin inside where the fat divides the light and dark meat and smear with some of the Rosemary Salt mixture. 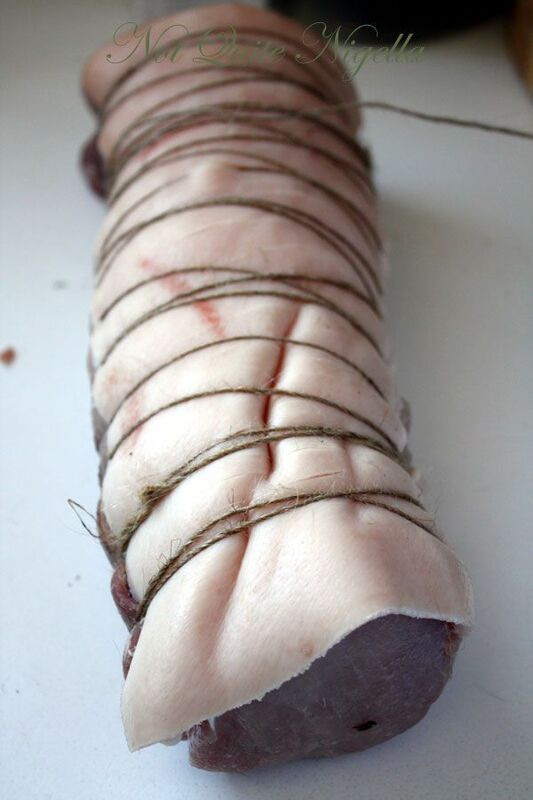 Tie the loin with kitchen string (my husband did this but a butcher can show you or do this for you) and place in a baking dish lined with baking paper. 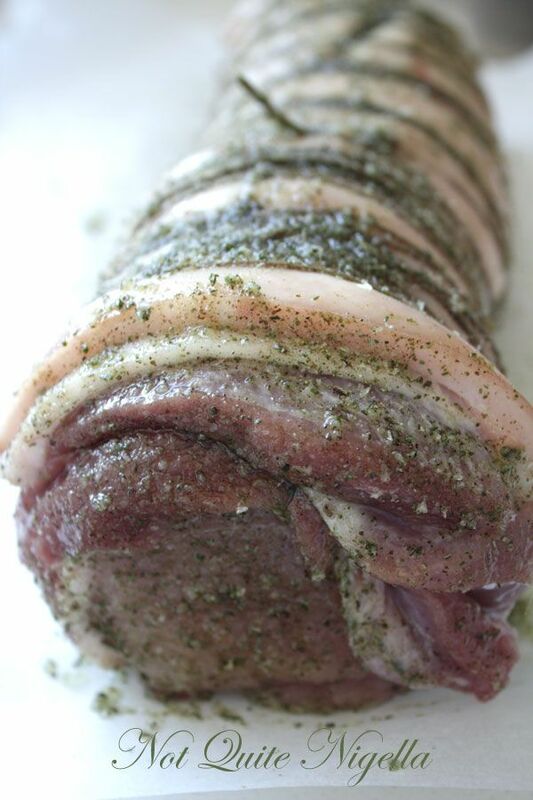 Rub the Rosemary Salt mixture onto the pork rind. Drizzle over with oil and massage into the skin. 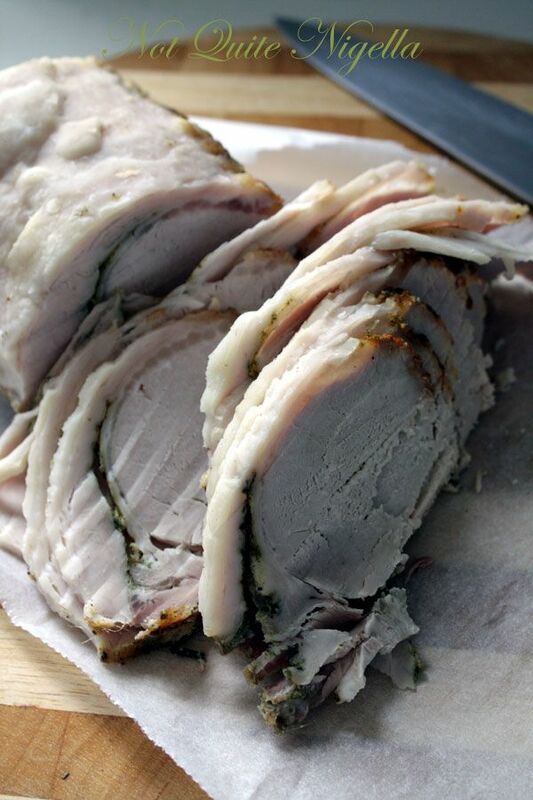 Step 4 - Roast pork at 220c for 30 minutes, then lower the heat to 180c and roast for 45 minutes. If the skin hasn't "crackled" turn up the heat to 230c or 240c and blast for 10 minutes until blistered and crispy. Remove the crackling and divide among eaters. 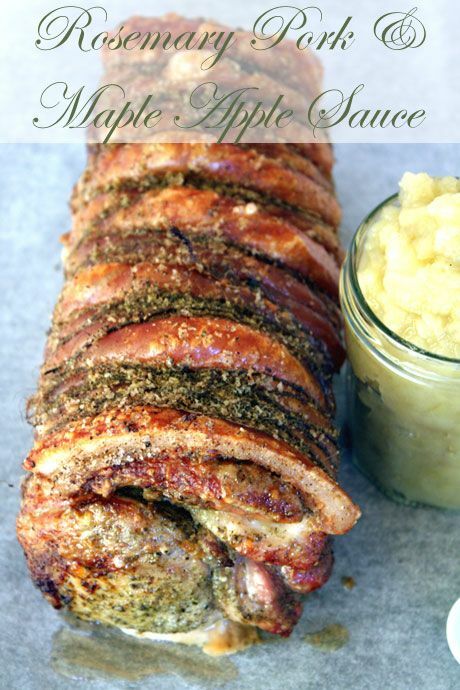 Slice the loin very thinly and serve with the Maple Apple sauce below and crackling. 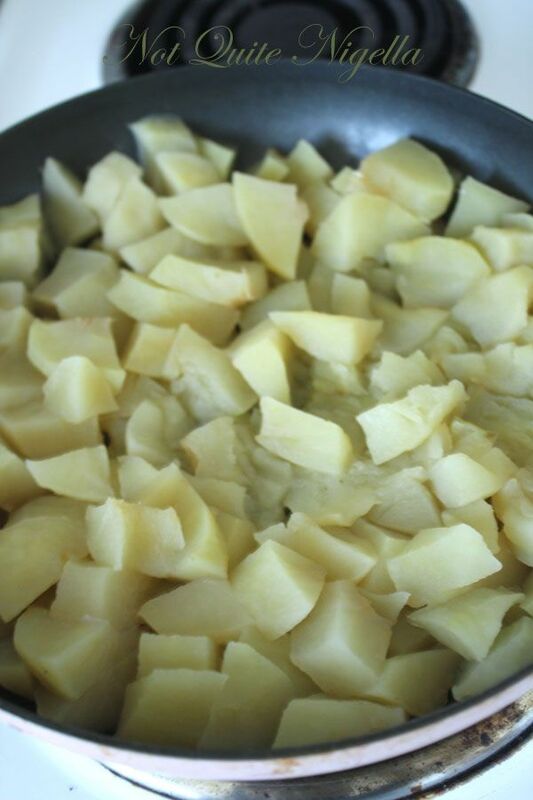 Step 1 - Place apple pieces and water in a saucepan over medium heat. Cover with lid and cook for 10 minutes until the apple is soft and mashable. Add maple syrup, salt and pepper and mash with a fork until it becomes a sauce. 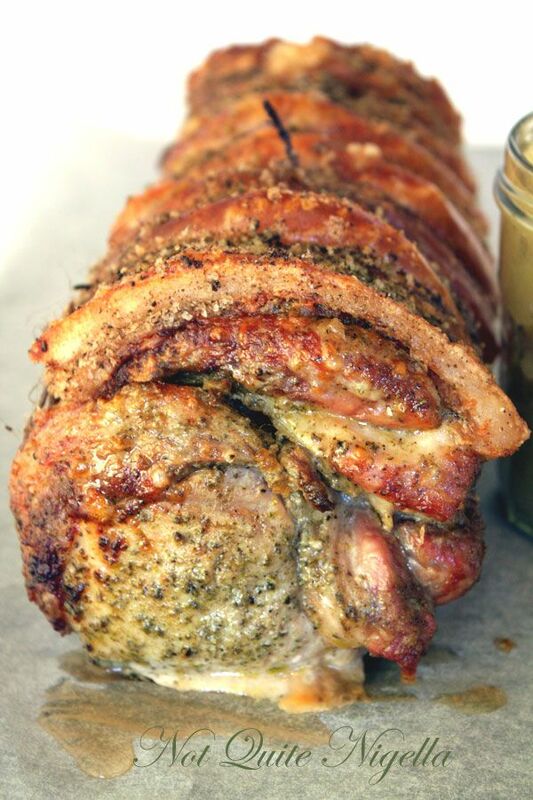 recipePlaying Chef With The Most Amazing Never Fail Pork Belly Recipe! recipeSpice Up Your Life With These Juicy Cuban Pork Chops! featureRed Cooked Pork Belly For Chinese New Year! recipe Playing Chef With The Most Amazing Never Fail Pork Belly Recipe! recipe Spice Up Your Life With These Juicy Cuban Pork Chops! feature Red Cooked Pork Belly For Chinese New Year!